What a fantastic week we just had. 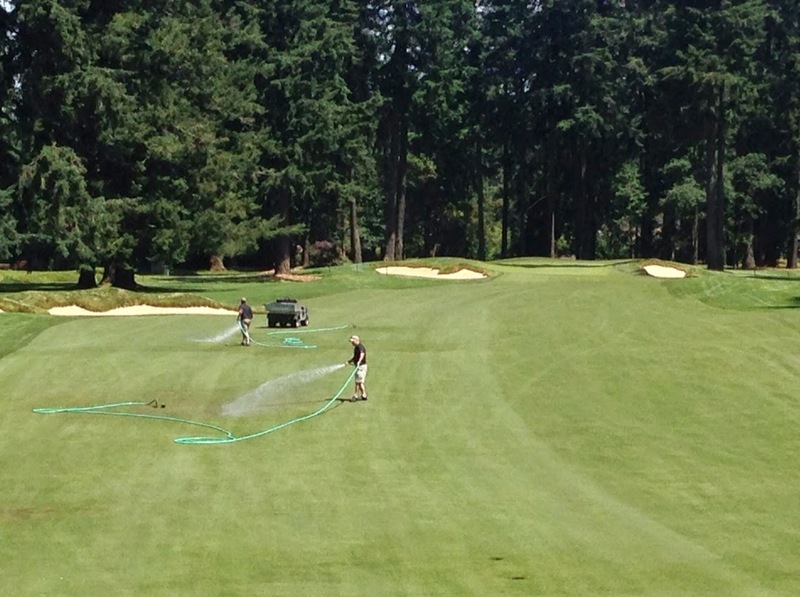 The weather has been so nice that we had to get out the hoses to keep everything alive while running it firm and fast for the Best Ball this weekend. The nice weather has also been perfect for the practice hole project. It hasn't been really hot.........just nice and warm which is great when your growing in sod.............and boy did we get some sod this week. 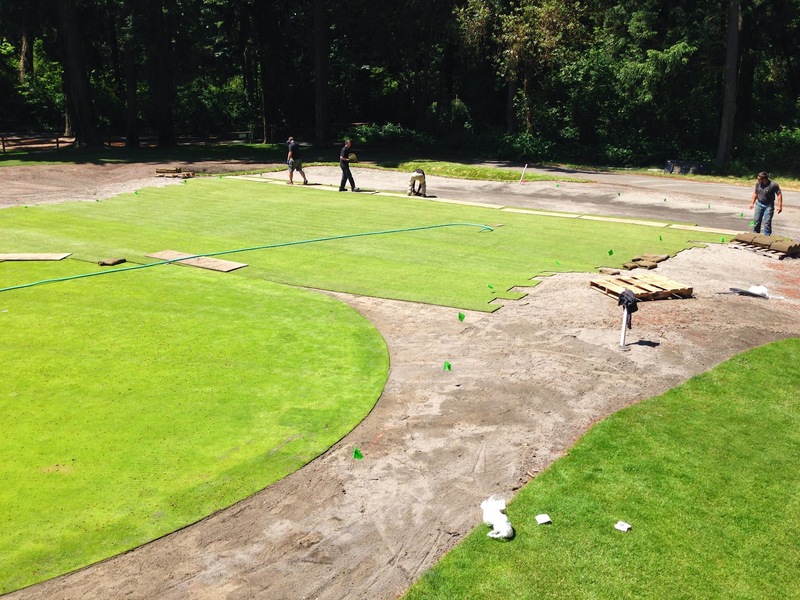 We started with 6000 square feet of putting green sod which came from a farm in Canada. The sod was cut at daybreak, loaded on a truck which crossed the border at about 8 am and then landed on our site at about 11:30 am. By 5 o'clock that afternoon, the green was finished. The following morning at about 7am, a truck with 12,000 square feet of ryegrass arrived from Moses Lake Washington. 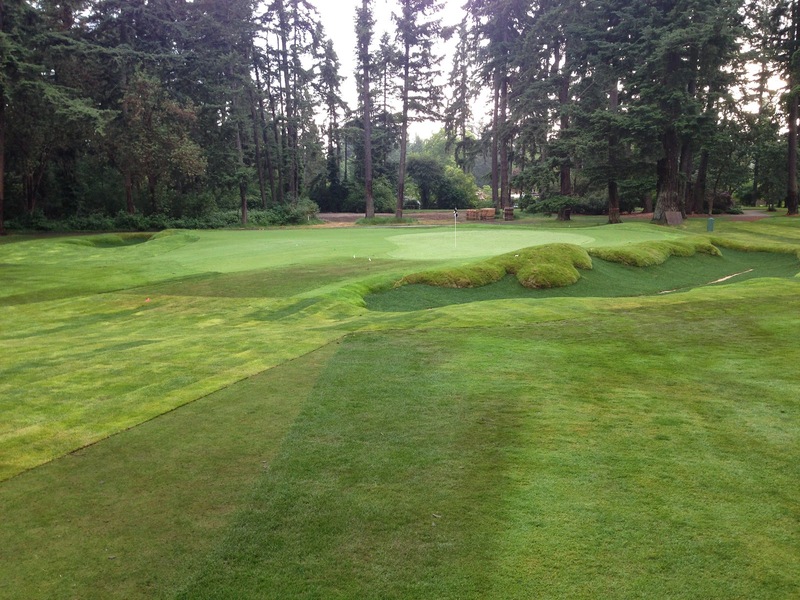 By 2 o'clock that afternoon that sod had been installed and essentially the entire practice hole project is complete and in healing mode. Soon all the sod will be healed in and it won't look like a bad quilt as it does in this picture above which I took the morning after all the sod had been laid. This is how it looks from the west side bunker. I must say I'm very happy with how it all came together. The green is really good sized and should work just as planned for multiple users of the facility. The bunkers have good depth and one should be able to practice just about every possible type of bunker shot conceivable. 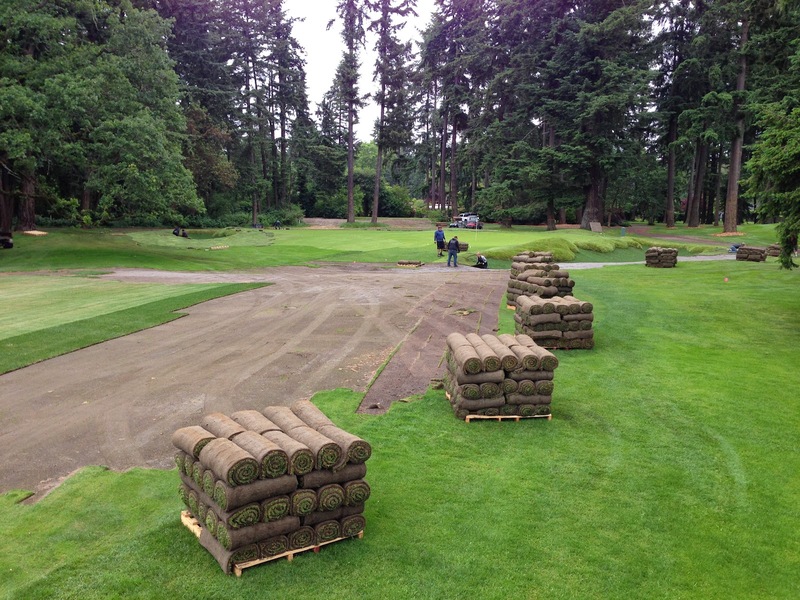 The final phase of the project is the expansion of the fairway areas both north and south of the green. If those projects are completed, this is going to be one heck of a short game practice facility. 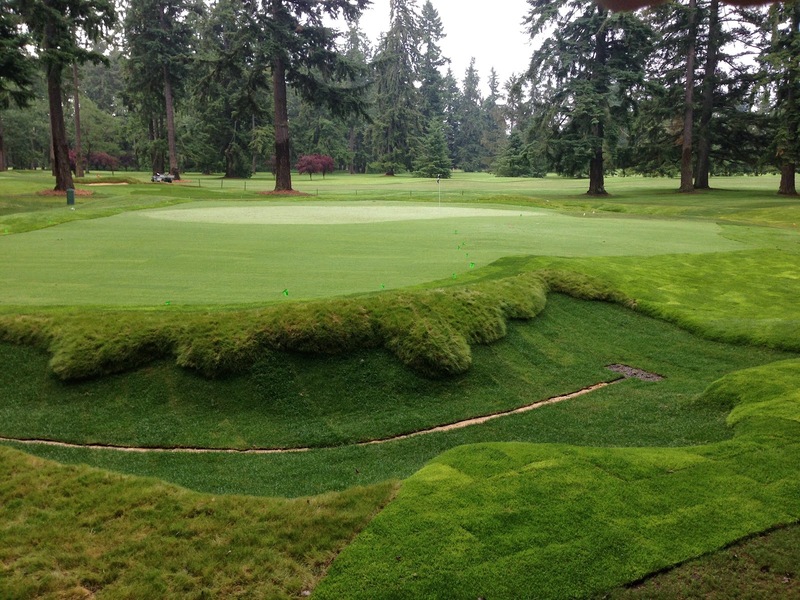 So when are we going to install the bunker sand???? 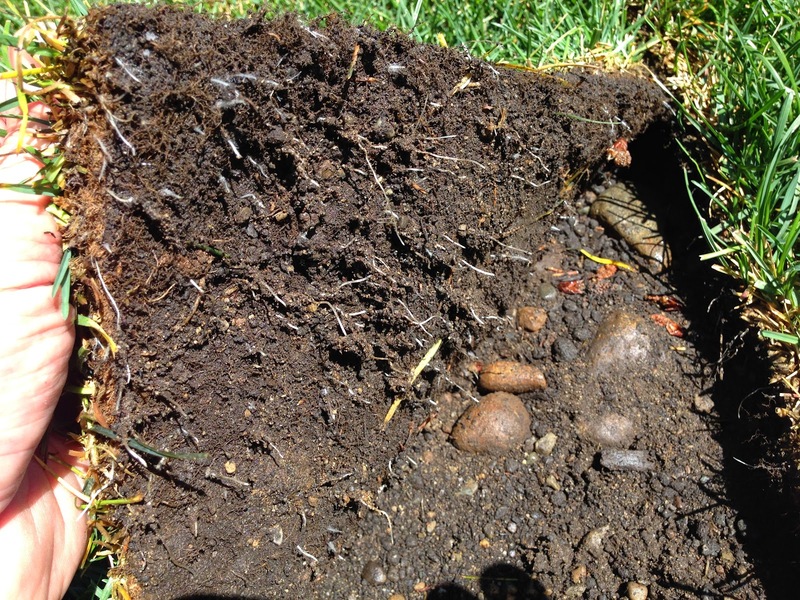 Here you can see the nice new roots on the liner sod. With the perfect weather we're having, I expect that this sod will knit down by the end of next week. Once I can't pull up the sod, we will spray it out and install the sand. I'm sure by the 21st, they will be ready and open for play. That would be one week ahead of schedule. You gotta love it when a plan comes together.